See, it is just dinner! Ok, to show you I am normal and don't cook every night, the boys had frozen pizza for dinner. I told you, I don't deprive. They wanted it and well, I was tired. I was a good wife and chatted with my husband on his way home late Tuesday night. (it's hands free in the car so don't worry) I figured since the oven was hot for the pizzas, I was throwing in some potatoes! I never give myself the time to do baked potatoes in the oven, but they really are better. Especially Yukon Gold potatoes! Jay (12) won't eat any other baked potato. They are perfectly firm with a fluffy, buttery interior. You can't blame him really. 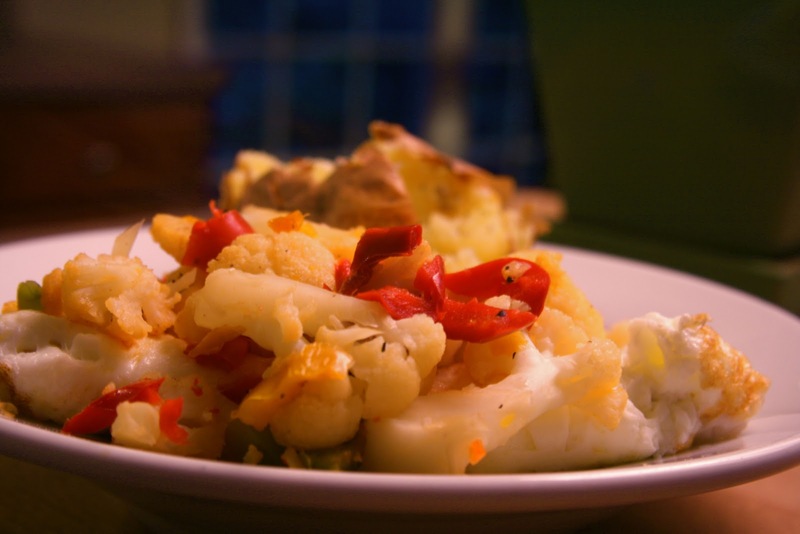 So, to make it balanced, I sauteed some peppers, onions and steamed cauliflower to go over my egg white omelet. Wait, now it's perfect. 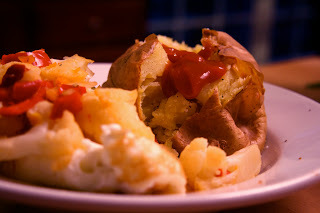 Yep, I am a freak, I like ketchup on my baked potatoes. Well, I'm a freak for more reasons than that, but we'll just leave it at that for now. I never liked fried food, so the only reason I would eat fries is to get ketchup in my mouth. I would like to take a minute and ask the rain gods to please give it a break for a while. I am cold and while I love fall and cooler weather, the wet with the cold is just too much right now. Thank you. So tell me, do you bake your baked potatoes or microwave them? What's your favorite topping for them? 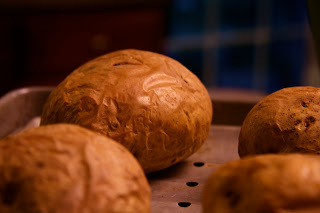 I'm definitely a purist when it comes to baking potatoes. It's just a shame to put them in the microwave when they come out so much better in the oven! I like mine with salt and pepper. I haven't planned ahead enough to put a potato in the oven in years! but it is so much better than microwaved. There's a great Mitch Hedberg line about baked potatoes: "It takes forever to cook a baked potato in a conventional oven. Sometimes, I'll just throw one in there, even if I don't want one. By the time it's done, who knows?" Yum! It's been so long since I've had a good old-fashioned baked potato! I usually microwave my potatoes, only because when I get home from work I am ready for dinner and I don't want to wait. On the weekends when I am home all day I will take the time to bake them. They really do taste so much better! My younger sister was a ketchup fiend too -- she'd put it on everything: the grossest was seeing her mix it into her rice. Blech! i usually microwave them because I don't want to wait all the time for them to bake. But...the few times that I have baked them they are so much better. 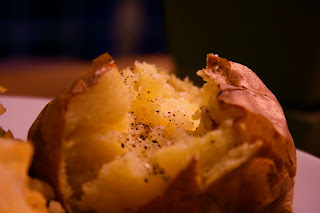 But you kind of got me craving a REAL baked potato now... maybe I'll take the time to make one soon! Where did you find a dairy-free pizza? Or was it normal and not everyone ate it? I'm asking because my daughter has a severe milk allergy and I have 3 kids 5,2 and 1. The baby has the allergy and so I am always looking for quick meals that contain no dairy at all. I perfer baked potatoes but end up microwaving them due to time and hunger. Hummus is always my go to potato topper. I'm with you on the rain and cold!! I usually do not wave, because I do not want to wait as long to cook. But I cooked a couple of times they are much better. I bake them. And ... butter! Oh my gosh! I love love love ketchup on baked potatoes! It's heaven! Great dinner Sarena!! I also think they are so much better in the oven, but I get lazy. I just made spaghetti squash in the oven for the first time 2 days ago and it was So much better! Its good you don't deprive your boys! I baby sit these kids and they go crazy with sweets and food when their parents aren't around because they restrict them. Kudos to you!!! I'm the same way when it comes with baked potatoes. I never make the time... and I really don't like microwaving them. I normally do them in the microwave, but they definitely taste better in the oven. I like them with salsa or marinara sauce. Kind of like ketchup! I'm sure you can guess that I usually do the microwave thing for "baked" potatoes. I guess that's why I mainly roast them in "coins" because it's quicker and they still taste better than the microwave baked. 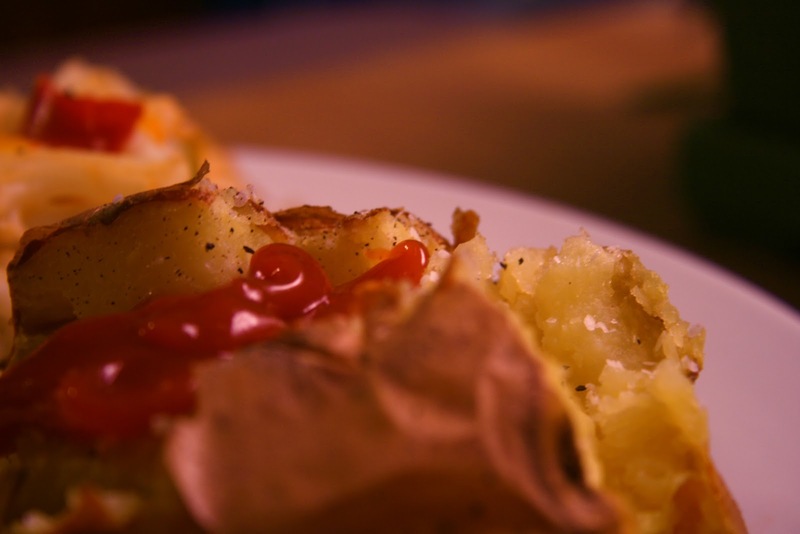 There is certainly nothing wrong with ketchup on potatoes! After all, they are basically french fries pre-fry, no? I cannot and will not cook a potato in the microwave! I just can't. My mom will yell at me and it just doesn't taste the same!